The Brearley School and the Chapin School are New York City's finest private schools for girls and they share not only their top standing but also their East End Avenue area neighborhood. 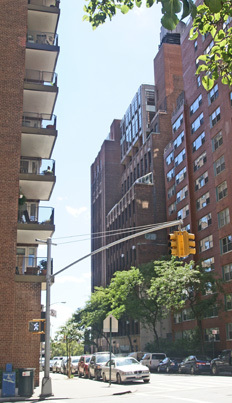 Brearley is located at 610 East 83rd Street, overlooking the East River, and the Chapin School is only a few steps away at the northwest corner of East End Avenue and 84th Street, overlooking Carl Schurz Park. The Brearley facility, erected in 1928, is more somber-looking than the cheery, Georgian-style design of the Chapin School, but Brearley, tucked away on a sidestreet, is one of the city's few high-rise schools. Its dark-brown-brick structure was designed by Benjamin Wistar Morris, the architect of the great, former Cunard Building at 25 Broadway, whose great hall is one of New York's most fabulous and awesome interiors. 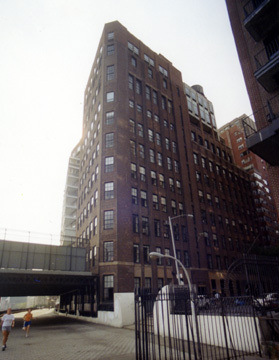 In his superb book, "New York Streetscapes, Tales of Manhattan's Significant Buildings and Landmarks," Harry N. Abrams, Inc., 2003, Christopher Gray devotes a chapter to the school and notes that "this façade mixes factory modernism with trim, elegant detailing, like ornamental pilasters of serrated brick," adding that "This was the type of styling that was remaking the face of Europe. It seemed revolutionary at the time when the traditional styles still reigned supreme in the United States." "The same spare modernism was carried out on the interior, where the walls were sand-finished plaster and the concrete beams and cork and brick walls of the gym carry the same decorative value as the slight Art Deco of the auditorium. Although the school has been indifferent to its building over the last several decades, it is still an architectural treat, inside and out," Mr. Gray continued. The design's strong sense of verticality is accented by its piers, which are similar in concept to John Mead Howell's design for the Panhellic Tower (now the Beekman Tower Hotel at 3 Mitchell Place, see The City Review article). The school was founded by Samuel Brearley Jr., in 1884 and opened in a brownstone at 6 East 45th Street. Mr. Brearley died in 1886 and two years later the school's parents commissioned Henry Rutgers Marshall to design a new school to house its growing student body. The new structure, which opened in 1891, at 17 West 44th Street was an impressive Medieval-style structure with an arched entrance, deeply recessed fenestration and a huge arched wall on its eastern facade. In 1913, the school moved again and built a 10-story neo-Georgian structure on the southeast corner of Park Avenue and 61st Street. In 1941, the John H. Finley Walk (named after a former president of the City Council and an associate editor of The New York Times), was opened extending the esplanade of Carl Schurz Park a few blocks to the south and providing an overpass extension to the Brearley School.